This handy application from Aspire media keeps you up to date with flight information from UK airports. 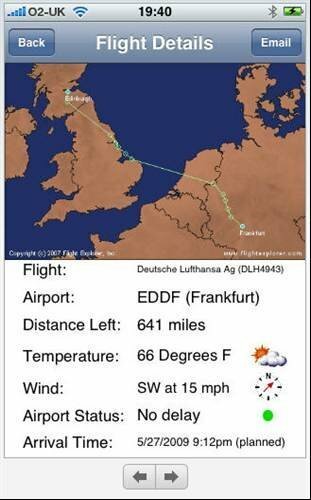 All major UK airports are included with real time information on flight status available. Apple’s iTunes App Store is one year old this week, but what are the hot applications for business users? Computer Weekly picks an application for every month of the online store’s life. These applications should be considered by IT departments and businesspeople because they can support mobile working and don’t require massive investment. See what software you can be bought for the same price as a packet of crisps. For as little as a one-off payment of 59p you can buy software to guide you through London’s underground or be kept up with traffic information. For a few quid more applications to manage your tasks, store and view documents as well as wide ranging office productivity tool suites are available. Security software is also available that allows business critical data to be transferred from point to point. These products are available at a fraction of the cost of their enterprise equivalents. This list will reassure potential business buyers that the iPhone is more than just a way to keep track of what’s happening on Facebook.